This rendering shows what Paul Revere Heritage Site planners hope the old copper rolling mill and surrounding area will look like when it has been fully restored and construction at the site is complete. CANTON — Standing on a hill overlooking a vast open tract of muddy land dotted with heavy construction equipment, it’s hard to conjure up a vision of a town green anchored by pieces of American history. But to those who have fought for a decade to preserve physical reminders of the legacy of Canton’s most famous resident, the image is clear. Paul Revere was also an entrepreneur. The famous resident was Paul Revere, who roughly a quarter-century after his rabble-rousing ride, opened up the country’s first copper rolling mill here. At the former Plymouth Rubber site, a barn and an old mill connected to Revere are being transformed into what the town hopes will become a gathering place and tourist destination, dressed up by trees, a new bridge, and a roadway. It almost wasn’t this way. Developers, excited by the prospect of about 37 acres of open land in a desirable town, had plans to build housing. Until the town said not so fast. Town Meeting rejected plans to fully develop the site, and now residents seem to be getting what they want: nine acres of open space plus rehabilitation of the barn and copper mill at 104 Revere St. The other side of the site will be developed, too, with 272 new housing units and some commercial buildings. 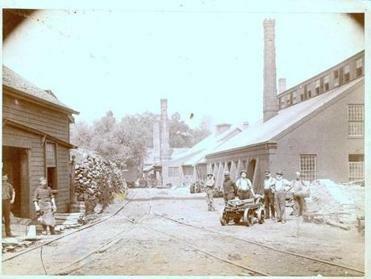 This photo, circa 1880, shows men working at the copper mill started by Paul Revere in 1801. The building on the right is the mill built by Revere's son, which is now being restored. The town hired a consultant to explore new uses for the buildings, with hopes that the mill and barn would someday be filled with a museum and restaurant that would celebrate Revere’s life after the Revolutionary War. In 1801, Revere bought land in Canton along the east branch of the Neponset River, but he already knew the site well. During the Revolutionary War, as head of armaments for the Continental Army, Revere purchased powder from a mill there. From there it grew to be a fortified military industrial site. The powder mill was destroyed in an explosion after the war. This photo, circa 1900, shows the copper yard and the east branch of the Neponset River, which is now buried on the site. The site once had many buildings, but they have nearly all been torn down, except for the mill and barn. 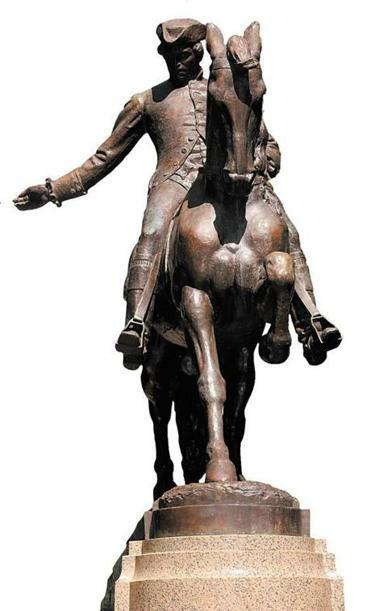 No one else was rolling copper in America when Revere risked his fortune to start his company, and he sent his son to England to see how it was done. Copper from Revere’s mill was used on the dome of the State House, New York City Hall, and to line the hull of the USS Constitution, Old Ironsides itself. More than 700 brass cannons were cast there and were used in the War of 1812 and the Civil War, according to “Canton,” Comeau’s book of historical postcards. A large brass bell from Old Ironsides, cast by a Revere apprentice, has been donated for display at the planned museum, along with two dress-uniform swords from the Civil War that belonged to Revere’s grandsons. The barn and mill have survived years of threatened demolition, and are being rehabilitated by the developer, Canton Holdings LLC, which is building the housing on the other side of the site. Based in Chicago, Canton Holdings owns the entire property, and will turn the buildings and nine-acre parcel over to the town under the terms of a development agreement struck in 2015. The entire project is using tools such as a district improvement financing plan and Community Preservation Act funds, and probably won’t be completed for several years. The Revere & Son Copper Rolling Mill is being restored as part of the Paul Revere Heritage Site. 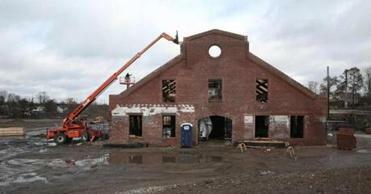 The mill, a large brick structure built by Revere’s son in the 1850s, is being painstakingly repointed, and bricks are being replaced wherever necessary. The roof wasn’t copper in the 1800s, but it will be soon. Revere Copper, which operates in Rome, N.Y., but traces its roots to Revere’s mill in Canton, is donating a portion of the copper that will be required. Jim Walas, that firm’s architectural manager, toured the site, and said it will require between 12,000 and 13,000 pounds of material, of which his company’s donation will be substantial, he said. “It was nice to go back to our roots,” Walas said. 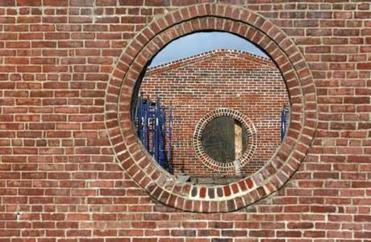 Two round stained-glass windows will be installed in the sides of the Revere & Son Copper Rolling Mill building. The materials are being shipped to be fabricated, and the roof should be installed by early spring. The barn was moved about 50 yards, and now sits closer to the mill. Only the original beams remain, and an adaptive reuse is underway. A new foundation has been poured, and an elevator, thermopane windows, and modern heating system will be installed. There’s a promise that even more history will be uncovered. The remains of the house that Revere lived in, which he renamed “Cantondale,” and eventually burned down, are buried on the site, and Comeau said there are plans for an archeological dig. “We’ve got this time capsule we have to open at some point,” he said. Already, the site is drawing visitors. Comeau leads tours, and so far has brought 110 people through the site. Those on the tour have also donated to the town’s efforts to bring the site back to life. The town’s hope is that the site will draw many more, and its consultant, who has worked on attractions all over the world, had some encouraging words. The site’s connection to the legendary Revere is one of its biggest assets in attracting tourists, ConsultEcon president Thomas Martin told town officials in late January. 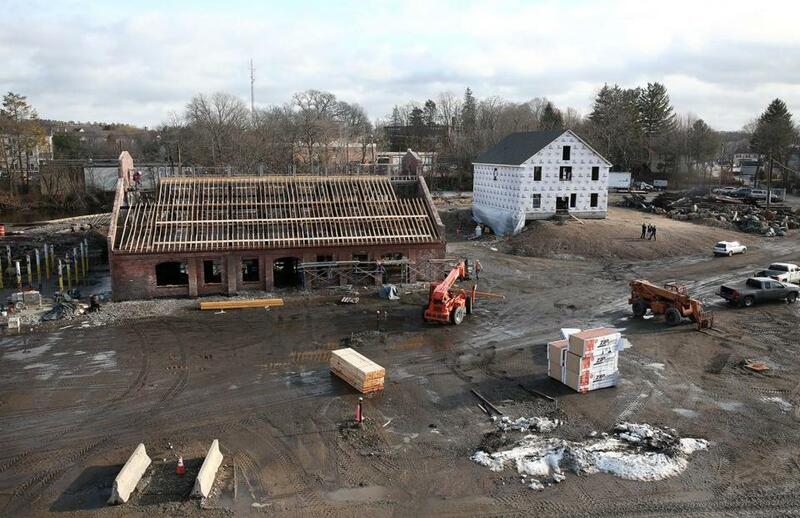 The Paul Revere Heritage Site in Canton will include two remaining historical buildings, the Revere & Son Copper Rolling Mill, left, and the Joseph Warren Revere Barn.